For those familiar with SOIL, the Household Toilet Project probably doesn’t sound all that new. For years we’ve dreamed about a social business model for providing household sanitation in Haiti, and today we are happy to report that our dream has started to become a reality! On October 30, 2012, SOIL and our partners at Re.Source installed the first 25 private household toilets in the Shada neighborhood of Cap-Haitien. The SOIL inauguration hosted yesterday was a combination of celebration and logistics: families signed a contract with SOIL, picked up their toilets, and participated in a SOIL training, but they also sang, danced, and rejoiced with Regional Director Theo Huitema. 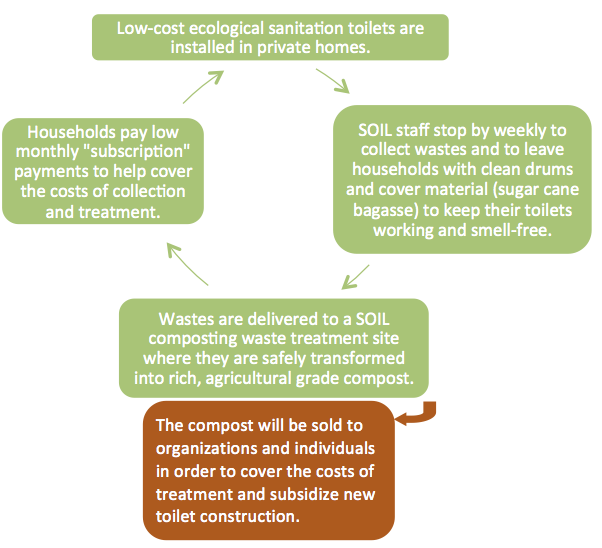 SOIL believes that compost sales and user fees collected from households wanting an ecological sanitation (EcoSan) toilet can cover the ongoing maintenance, collection and treatment costs of providing household sanitation services. To test this hypothesis, SOIL and our partners plan to build household toilets in the Cap-Haitien neighborhood of Shada. We have established a biweekly collection system and the wastes collected will be treated at SOIL’s composting waste treatment site in Limonade. The compost generated will be sold to help subsidize the household toilet project and cover the ongoing costs of waste treatment. Small monthly user fees will be collected from participating households to ensure buy‐in among participants, and to demonstrate a healthy revenue stream that can inspire and attract small businesses in Haiti. We hope this project will provide a point of entry for small Haitian businesses to begin participating in the service delivery system and/or implementing similar projects of their own – thereby helping to increase sanitation access across Haiti, contributing to long-term job creation and building up a system that can continue long after international aid for Haiti has dried up. Yesterday’s training and installation was done in partnership with KOSS, a collective of the nine community-based organizations in Shada. KOSS will continue to be involved throughout the project by helping to promote hygiene education programs and activities and by monitoring that the toilets are properly functioning and well-received. In the coming months, SOIL and our partners will continue to install more toilets in the Shada neighborhood so stay posted for updates on early results and successes! SOIL’s Regional Director, Theo Huitema, follows SOIL staff (watch out for appearances of Madame Bwa, Erinold and Josapha!) and Re.Source researchers (special appearance of Sebastien Tilmas) through Shada as the first household EcoSan toilets are brought in. No Replies to "SOIL Launches the Household Toilet Project in Shada, Cap-Haitien Haiti"